Hello everyone, I found a peculiar bug in the Demo Day 22 Sipho edition. 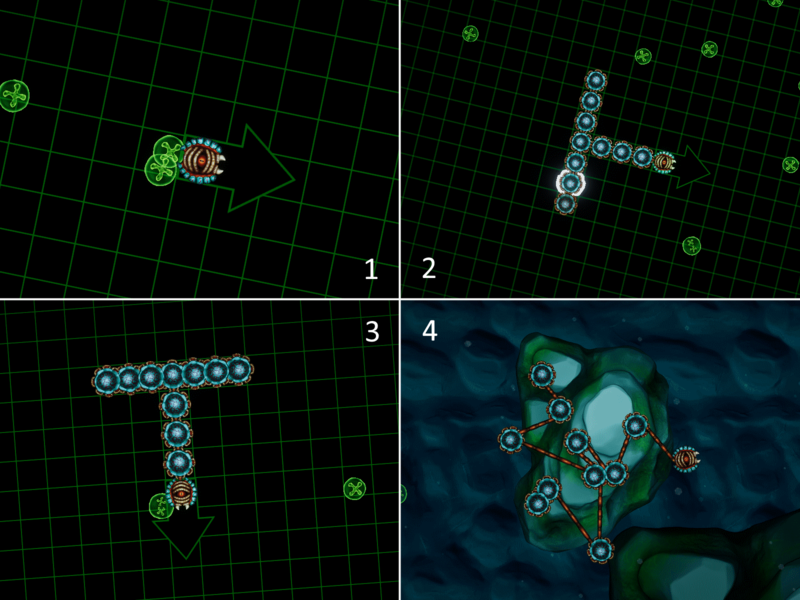 It can be reproduced like this: delete all creature parts, then put structure parts in a T shape as depicted on the image (don't put anything else but structure parts). If done right, creature structure in the editor will become distorted slightly and the grid will tilt a bit. Upon the exit from editor window something bizarre will occur: creature parts will move on their own, twisting and stretching the structure, likely "explode" and scatter parts across the map or get them stuck in walls or destroyed on spike debris. Edit: notice how on the 3d image the top of the T shape takes less space than it should. That's the distortion we look for. It's a known issue in our soft body solver. It doesn't handle larger symmetric builds which we didn't expect it to surface in normal play conditions. I'm going to take a note it's a higher priority issue than we anticipated. Thanks again! I'm all-too-familiar with this bug, especially since 99% of my builds are symmetrical (even the one build that isn't mirror-symmetric is radially-symmetric instead). The bug can also present itself in other forms as well: Any sign of the grid shifting, no matter how slight, is a sign that this bug is surfacing. Side effects include the inability to place zooids in areas that you usually could on the other mirrored half of a symmetrical siphonophore (i.e. the game is literally forcing asymmetry), and sudden distortion while placing zooids.